Dubai: Student builders of the winning ‘house of the future today’ — the FutureHAUS — said everyone can build exceptionally-designed and functional houses while keeping the environment in mind. The FutureHAUS Dubai by Virginia Tech in the US bagged the 2018 Solar Decathlon Middle East Award on Wednesday, winning Dh900,000 as cash prize. Shaikh Mansour Bin Mohammad Bin Rashid Al Maktoum handed the award to the students in the presence of Saeed Mohammad Al Tayer, managing director and CEO of the Dubai Electricity and Water Authority (Dewa). The international competition, created by the US Department of Energy, is being held in Dubai for the first time, in partnership with the Dubai Supreme Council of Energy (DSCE) and Dewa. The award ceremony is the culmination of two years of hard work by more than 600 students and faculty members from 28 universities from Europe, North America, Asia, and Australia, and representing 54 nationalities. The total cash prize given away was Dh10 million. “We want to engage the youth to give them the opportunity to unleash their innovative ideas in building sustainable houses for the future. This is in line with our vision to strike a balance between development and preserving the environment,” Al Tayer said. Al Tayer commended the students for their hard work, especially this past month, when they had just two weeks to build the houses next to the Mohammad Bin Rashid Solar Park. Displaying innovative design and functionality is the FutureHAUS’ main strength. It integrates smart technologies with a sustainable dwelling. Its entertainment space in an outdoor garden has a perimeter screen for privacy. Bobby Vance, project manager of FutureHAUS Dubai, has three tips for anyone considering building a similar house. “Look at prefabrication because you have much more control when you do that. Look at innovative ideas to that help make the planet greener and more cost-efficienct, and [also consider] how someone can live in the house for life,” Vance told Gulf News. The FutureHAUS uses a plug-and-play concept where all the house’s components such as plumbing, electricals, roof, walls, among others, are pre-manufactured and pre-fabricated in cartridges, for easy transport and assembly. It is surrounded by a ‘mashrabiya’ (a projecting window typical of Arab architecture with lattice work) made of steel, giving the occupants privacy and shade at the same time. The house is adaptable with flexible spaces and can be put together in a matter of days by anyone. Vance said the team will fly their house back to the US, work on it for two months, before taking it on a tour covering New York, Chicago and Washington DC. 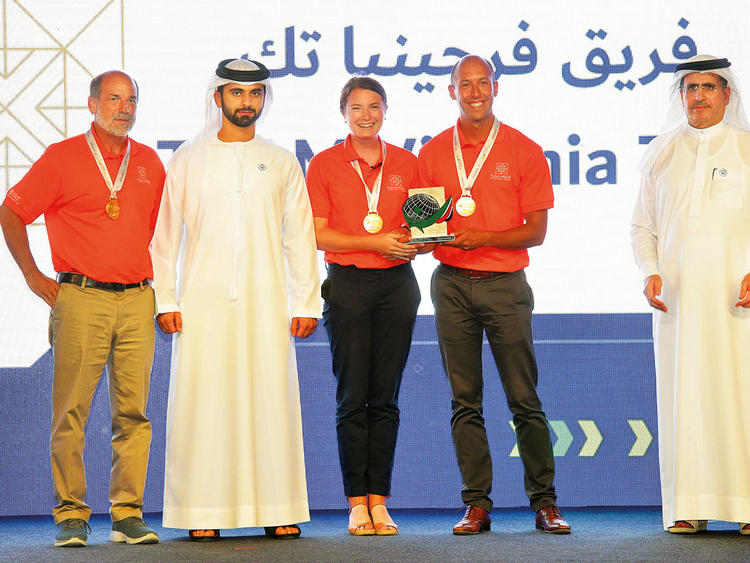 Desert Rose, the house built by students from the University of Wollongong (UOW) Australia and Dubai and TAFE New South Wales, received the second prize in Solar Decathlon and first prize for Innovation. Clayton McDowell, project manager and student leader of Team UOW, said they also will be taking their house back to Australia and “someone will actually live there”. The prototype houses were judged based on 10 criteria: architecture, engineering and construction, energy management, energy efficiency, comfort conditions, house functioning, sustainable transportation, sustainability, communications, and innovation. The next round of Solar Decathlon will be held in 2020 coinciding with the Dubai Expo.